Birds of prey, or “raptors” are a group of birds including hawks, eagles, vultures, falcons, and owls. They share two key characteristics: all have hooked beaks for tearing flesh, and sharp talons for grasping prey. These birds are an important part of maintaining a healthy ecosystem by feeding on insects, rodents, fish, and small mammals and birds. Raptors posses incredible senses which give them the ability to detect and catch their prey. 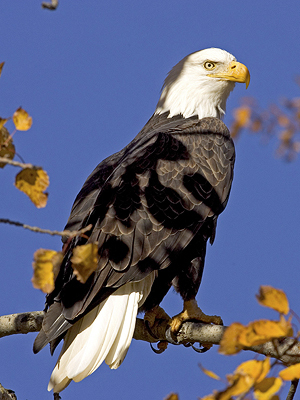 Bald Eagles are well-known for having amazing eyesight. Raptors have binocular vision, allowing them to “zoom in” four to five times farther than humans. This allows them to spot prey up to two miles away! Hawks have great visual acuity – the ability to see detail; whereas owls have amazing sensitivity – allowing them to see clearly in darkness. Raptors also have two focal points, one for close up vision and one for binocular vision. The eyes of raptors are fixed in their sockets, so they bob their heads up and down to judge distance. Raptors can also see colors more vividly than humans, and even perceive colors that are invisible to humans in the ultraviolet (UV) spectrum of light. Most species of raptors have excellent hearing. Great Horned Owls do have ears, but they do not stick up from its head- those are just feathers! Raptor ears are actually hidden beneath feathers on the sides of the face. These feathers form a “facial disc” which directs sounds into their ears, allowing them to find prey in near complete darkness. Owl ears are asymmetrical, so they can pinpoint the source of the sound by the time it takes it to reach each ear. The Northern Harrier is a diurnal bird of prey that hunts almost exclusively by sound, and like owls has a facial disc to better detect prey.